Meath County Council Arts Office is thrilled to announce the launch of its first exhibition of 2019 at Toradh Gallery in Ashbourne Library and Cultural Centre. 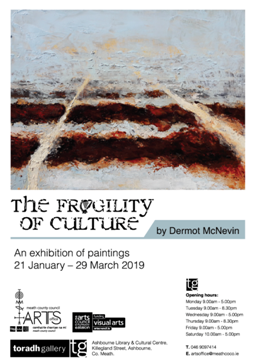 The Fragility of Culture by Trim based artist Dermot McNevin is a collection of new abstract painted works on canvas, accompanied by an original film piece inspired by the traditional Irish Harp. Enveloped in themes of colonialism, heritage, resistance and change, McNevin presents an intriguing collection of 14 paintings culminating in an impressive visual display. Utilising a palette of sumptuous earthy tones, McNevin uses linear patterns and horizontal lines to reference the Irish landscape and its tumultuous past. Imagery of land, line and harp combine in this guttural response to McNevin’s themes of invasion and corresponding cultural casualty. ‘While making this series, I immersed myself in traditional Harp music. I researched the decline of this musical form, which resulted from the fall of the Gaelic order. This, I saw as a metaphor for the fragility of culture. I then used the paint in a visceral way to explore these tensions. The Fragility of Culture by Dermot McNevin presents emotive, tactile works which lament lost art and reference political themes of land division which; in the context of contemporary Ireland and a looming Brexit deal, are once again considered relevant.